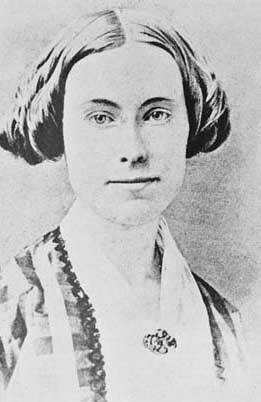 A native of Dryden, New York, Julia Pierpont was the wife of Francis H. Pierpont who is widely recognized as the "Father of West Virginia." Francis Pierpont served as the governor of Restored Virginia during and after the Civil War. His plan made it possible for this part of Virginia to gain statehood, becoming the new state of West Virginia on June 20, 1863. OUR JULIA PIERPONT DAY CELEBRATION on May 26, 2012 included a Breakfast Buffet and Program at the Pierpont C&TC Center at Veterans Square along with music. The program was continued at Woodlawn Cemetery with a walk to the gravesites guided by Dr. JoAnn Lough with Civil War re-enactors in attendance. Wreaths placed on the graves of Boaz Fleming and Julia and Francis Pierpont. 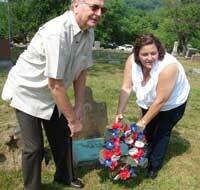 In addition, 19 Civil War markets were placed on veteran's graves. 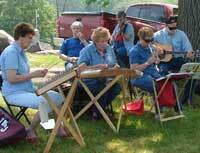 Wha-ke-we-nn performed Civil War music at both venues. At the conclusion, the Cemetery Superintendent led a tour through the "old part" of the cemetery. 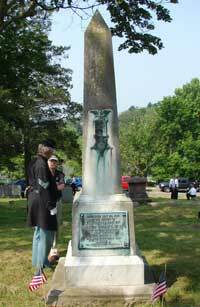 Julia Augusta Robertson Pierpont (1828-1886) of Fairmont, WV is credited with being an originator of this nation's Decoration Day, renamed Memorial Day in 1882. In May 1866, following the end of the war and while living in the Virginia Governor's Mansion, Julia and a Miss Woolsey, an NY girl teaching in the schools for African American children, decided to decorate the graves of the Union soldiers buried in Hollywood Cemetery in Richmond, VA. The graves were dismal and neglected. Julia, Miss Woollsey and a number of children, relatives and teachers bravely "paraded" to the cemetery to decorate the graves. Some approved and others condemned, but news spread of the event. 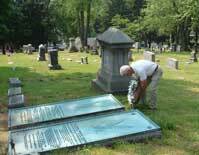 A few weeks later a similar Decoration Day occurred in Richmong and thousands came from all over the state to decorate the Confederate graves. News spread throughout the nation and more events followed. What Julia had done inspired others. 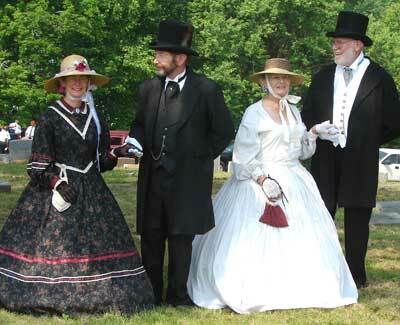 There are records of other Decoration Days prior to and following that one in Richmond, but many historians feel Julia Pierpont was largely responsible for the creation of an annual "Decoration Day" ordered for May 30. In 1987 a project by WVU's Public History Program with financial assistance from the Humanities Foundation of WV and supported by the WVU Center for Women's Studies, WV Women's Commission and the WV Historic Preservation Unit established Julia Pierpont as the originator of our annual celebration of Memorial Day. Francis H. Pierpont and his wife Julia Augusta Robertson are both buried in our Woodlawn Cemetery. Their graves are marked by bronze plaques donated by the William Haymond Chapter of the D.A.R.